Long Jack Phillipus was born in Kalipinypa, a major Water Dreaming place, northeast of Walungurru, in his mother's country. When Long Jack was a teenager, he and his family came in to Haasts Bluff, where he worked as a timber cutter and stockman and was married. 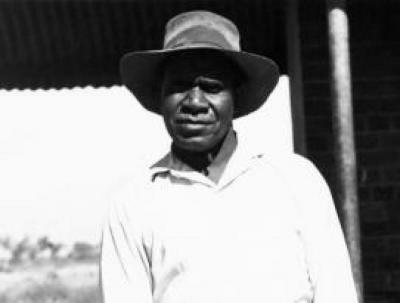 In 1962 Long Jack moved to Papunya where he still lives, and initially worked as a gardener and groundsman. As a councillor working in the vicinity of the school, he was one of the founding members of the painting group in 1971 and quickly developed a relationship with the recently-arrived school teacher Geoffrey Bardon. Along with Billy Stockman who was also a school yardman, he painted two smaller murals on the school walls, a Widows' Dreaming and a Wallaby Dreaming, before collaborating with Kaapa Tjampitjinpa and Billy Stockman and others on the painting of the large Honey Ant Mural. Long Jack's work encompasses the Spinifex Wallaby, Kingfisher, Dingo, Possum and Emu Dreamings. A number of his early works on board depict decorated ceremonial participants and ritual objects that may have been motivated by the lively environment of the Men's Painting Room, which prompted the artists to visualize the strength of their culture and law. In 1983 Long Jack won the Northern Territory Golden Jubilee Art Award. The following year, he won first prize in the Alice Springs Caltex Art Award and was ordained as a Lutheran pastor. He was chairman of Papunya Tula Artists in the early 1990s.